If I remember correctly, I met Muharem Murselović in 1998, but not in Prijedor. He could not show up in his hometown, cause of the ongoing effects of ethnic cleansing (a year earlier, the war long over, dozens of rebuilt houses had been blown up to discourage the rightful owners from returning) and because the municipal administration was still headed by members of the Crisis Committee that, six years earlier, had organised the pogroms against the "non-Serbs", i.e. the majority of the inhabitants of Prijedor. Mursel (as everyone called him) was one of the representatives of the Bosnian Muslim community than in the four years of war ended up in concentration camps, was murdered, raped, made disappear, dispossessed of everything (the houses burnt or confiscated, the bank accounts vanished...), and finally expelled. Only a few people, in the tragic hours of the destruction of the village of Kozarac and of the Lijeva Obala (the left bank of the river Sana), had managed to escape. The survivors' stories tell about the tragedy of those days in late April 1992, the pain of the broken lives and families, the violence of the white band for identifying the "Balija" (as the Serbs called the Bosniaks), and the erasure of a special European history when, in one night, fourteen mosques and everything related to "non-Serbs" was blown up with dynamite. Mursel, a caterer and hotelier, was part of this erased majority. I was not intimate enough with him to ask how he ended up in the concentration camps of Omarska and Manjača, and how he came out, but I can witness how he spent the following years fighting like a lion for the right to return, and finally becoming a member of Parliament, he who had always stayed out of politics until then. 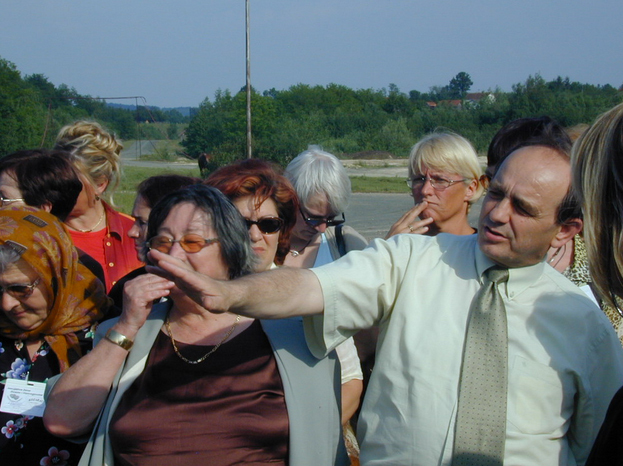 We, members of different associations belonging to the Italian solidarity movement with the former Yugoslavia, knew that intervening in Prijedor in those years meant relating to a crippled town. This is why we tried from the outset to start a relationship with the other half of the town, those who had fled to Rijeka-Fiume, Velika Kladuša, or Sanski Most. And this is where I had the first talks with Murselović, in the discretion that is owed to those who have already suffered enough for the nationalist delirium. He was wary of us: we had chosen to start a relationship also with the "enemy", to try to get also the Bosnian Serbs out of the international isolation that locked them deeper and deeper in their nightmare, but he immediately realised that what we were starting to do could contribute to his same goal – to return people to their homes. He was tough. He spoke to us in his metallic voice, describing the gangsters we were dealing with, warning us, but leaving open a window of opportunity, perhaps because he sensed, with those eyes always on the go, that we were made of something else. He openly acknowledged that a few years later. It was the August of 2000 – there was a demonstration for the return, and over 10,000 Bosniaks invaded Kozarac and Kozaruša, where the first rebuilt mosque was inaugurated. On that occasion, I was there with them and Mursel thanked us for our work. The unimaginable was happening, a return that we had helped making possible. Unlike other members of that community, Mursel kept telling us that we were too focused on the municipality, but he used to act like that, as if we were in a permanent negotiation. And yet he did not hesitate to rent us his downtown premises for the headquarters of our Agency for Local Democracy (LDA), thus annoying the Serbian authorities. By then Prijedor was already a different town than the "inaccessible capital" our friend Luca Rastello reported about in his novel "War at home". The return involved nearly 20,000 people. The reconstruction of the towns of Kozarac, Hambarine, Rizvanovići, and finally Stari Grad was happening. And Prijedor, also thanks to the LDA and the OSCE, was constantly monitored by the international community. Those were months and years of complex, delicate work. Our delegates (Annalisa Tomasi and later Patrizia Bugna) were tested in their ability to maintain a sort of diplomatic balance in a conflict that continued in Bosnia's long post-war period. Mursel was a true partner, relentless, sometimes harsh and unpleasant, but always interesting to listen to and interact with for me, when I came to Prijedor from time to time. I remember his commitment to build a memorial on the site of the Omarska concentration camp. Each August, he would lead the demonstration of women and men who came from around the world to remember their murdered relatives or their own internment (see photo). I remember his stories about the "white house", the small building that still exists in the vicinity of the great hangars of the mine, where inmates were interrogated, beaten, killed. The Prijedor municipality (as well as the owner, Anglo-Indian multinational Arcelor-Mittal) has always refused to recognise it as a place of remembrance, as if to deny the tragedy perpetrated there. Now that Mursel is gone, I believe he should be paid tribute, and this is what I wanted to do with these few words. I also believe that the best way to pay tribute to him should just be the creation of that "place of memory" in Omarska for which he fought in vain. Goodbye Mursel. Now that you are walking on a different road, I would like that your memory could help in testifying the ongoing need to remember what your town experienced in the nineties, something that today's quest for normality risks to erase. Not so much for condemning anyone, but rather so that history (and its elaboration) can teach us something.